Well, I’ve done it. I’ve now converted Z to my “store-bought ice cream will never be good enough” ways. It wasn’t hard to do. I made this flavor just for him. It’s a classic combination of two of his favorite flavors – coffee and chocolate. The fact that I’ve made a coffee ice cream that has made him renounce all other coffee ice creams is a pretty big feat, I think. Sometimes we all need a little crunchy jolt in our ice cream, right? When I initially tried the lovely cacao nibs that I got (for pretty cheap!) at one of the local health food stores, I observed that it reminded me of chocolate covered espresso beans – chocolatey but bitter. 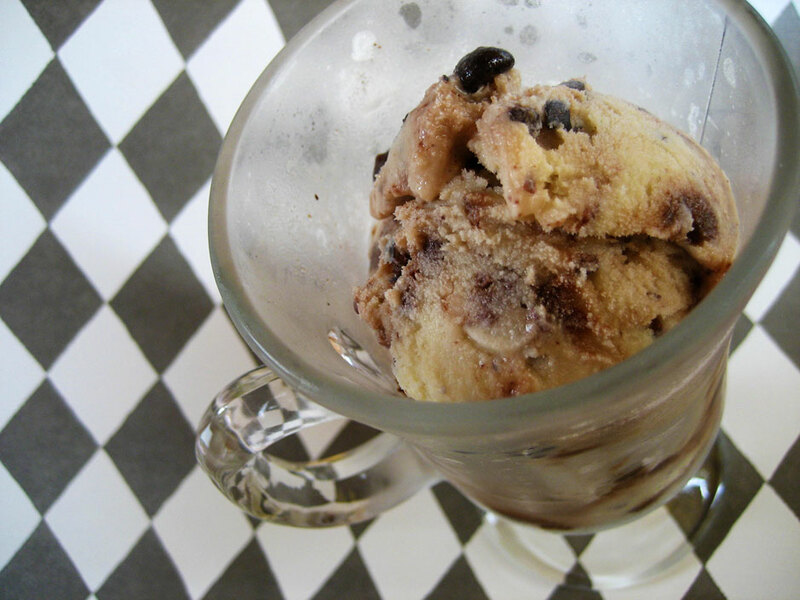 I mused that they would go well in a coffee ice cream…perhaps with some real espresso beans thrown in…and a fudge swirl to REALLY take it over the top. The pictures in the glass were taken earlier than the bowl pictures, hence more beans in the glass and more swirl in the bowl. Clearly, it worked out wonderfully. I bought some incredibly fragrant beans that were specifically labelled as espresso beans at Whole Foods last week, as well as some crazy good local cream (so good that when I whisked the cream mixture into the egg yolks I ended up with soft peaks, and I wasn’t whisking that hard…the cream mixture was also half milk…that’s some damn fine cream). Once again, leftover mix-in means sauce for ice cream! I was also able to make use of more of the homemade Tia Maria from my mom, throwing a couple Tablespoons into the custard to inhibit freezing, as well as using it to replace the vanilla extract called for in the fudge sauce recipe…also to inhibit freezing. And to help tie together the overall mocha-ness. I feel caffeinated just looking at it. 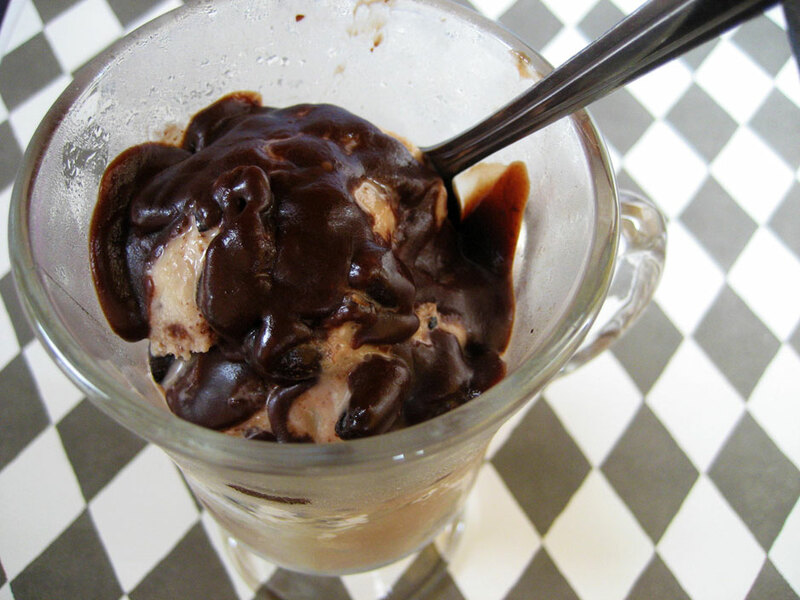 One issue I did have is that the beans wanted to float to the top of even the mostly-frozen ice cream, while the bigger swirls of fudge stayed towards the bottom. So there are fewer crunchy, fun little bitter surprises as we work our way through the container, but there is also more fudge. And more fudge is rarely a bad thing. I suppose that the distribution of mix-ins would be a little more even if I had, you know, an ice cream machine, and while I very nearly bought one last week, I resisted, knowing that I can do just fine without…but I still want one. Fudge and beans, in harmony! Combine the cream, milk, sugar and espresso beans in a medium saucepan. Bring just to a low boil to dissolve the sugar, then allow to steep up to 30 minutes. After steeping is complete, strain out the espresso beans. In a large bowl, whisk together the yolks and salt. Whisk in 1/4 cup of the cream mixture, then follow with the rest, pouring it in a thin, steady stream while whisking constantly. Return the mixture to the saucepan and cook over medium-low heat, whisking constantly, until thick but not boiling. Pour back into the bowl and whisk in the liqueur. Allow to cool fully, stirring occasionally. Pour into a large sealable container and freeze (or use an ice cream machine, whatever, fancy-pants) for 3 hours. 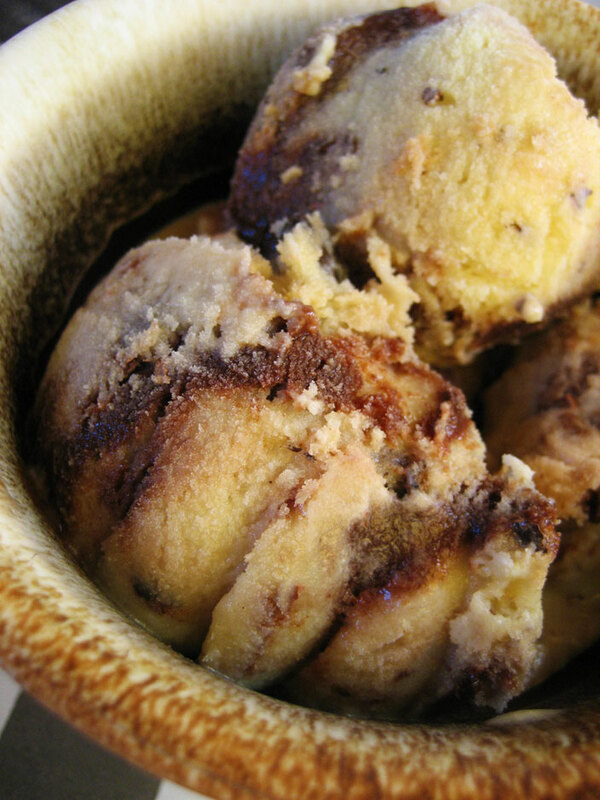 Place cream, corn syrup, sugar, cocoa, salt and half of the chocolate in a small saucepan. Bring to a boil, stirring gently until the chocolate is melted. Reduce heat to low and cook at a low boil, stirring, for 5 minutes. Remove from heat and add the rest of the chocolate, the butter and the liqueur, stir until smooth. Allow to cool fully. 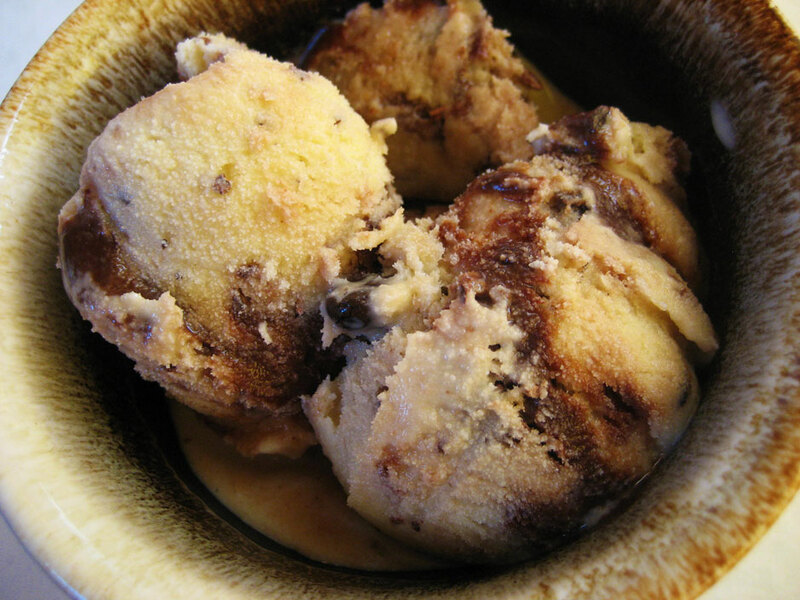 Remove ice cream from freezer; it should be almost completely frozen but still very soft. 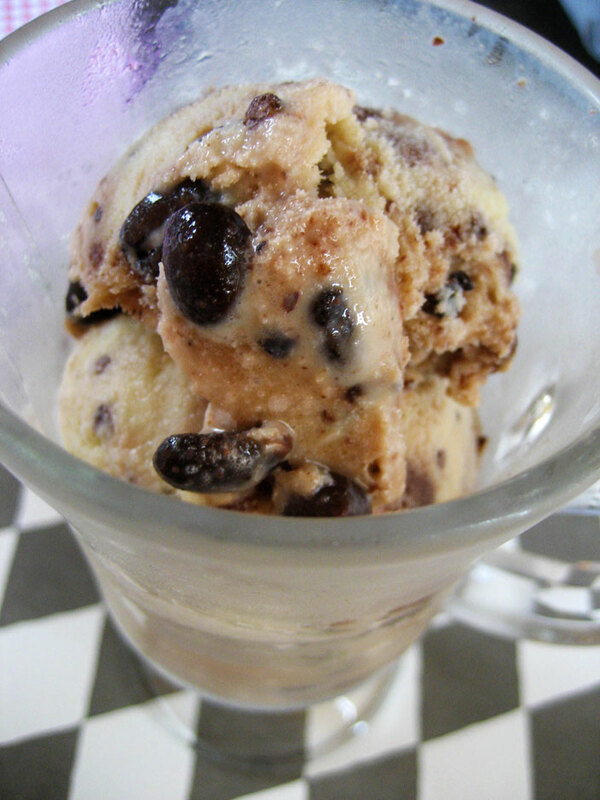 Pour in the beans and nibs and stir until they are evenly distributed throughout the ice cream. 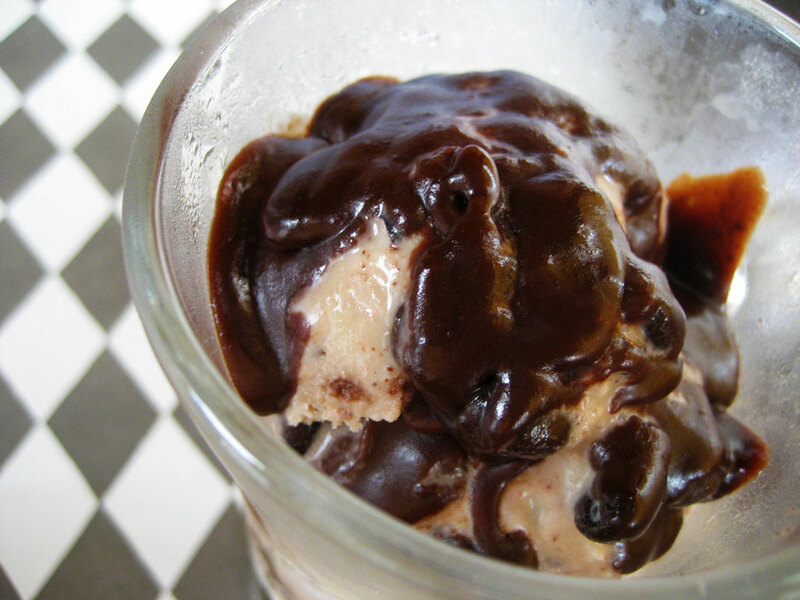 Slowly pour in the fudge sauce, gently folding it in and letting it pool in some places for extra awesome swirlishness. Re-seal the container and allow to freeze another hour, or until thoroughly frozen. Enjoy with extra fudge sauce. YES! Store bought is never as good as home made I totally agree and it’s funny that you say it wasn’t hard to convince. I agree, all they need is a taste to be converted to the goodness of home made ice cream. It looks wonderful! You should be arrested for making this! I can’t believe how utterly sinful that ice-cream looks!! There goes my resolution to stay off sweets for a week…..
ah! 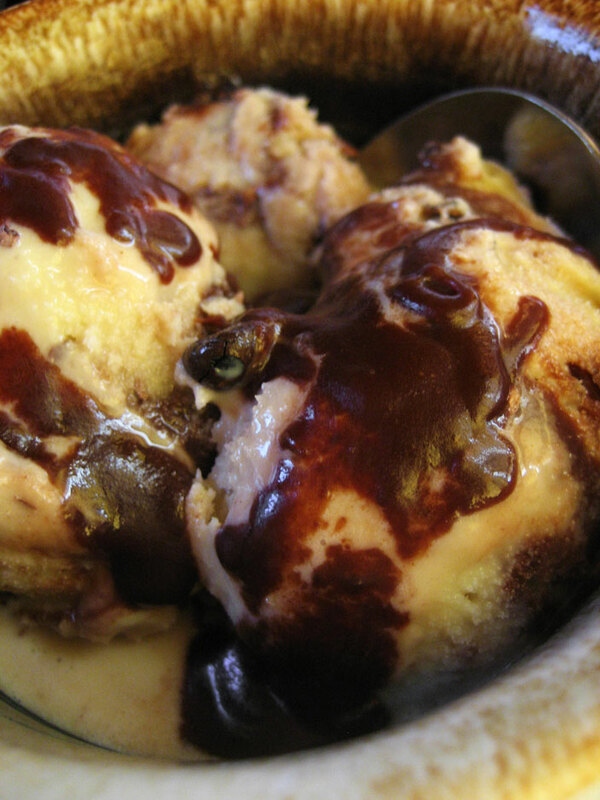 i am so impressed you made such creamy ice cream without an ice cream maker! this sounds delicious. Yummy…Coffee and chocholate are the best flavour combinations. I’m thinking to subtitute the espresso beans with hazzelnuts. What do you think?